Do you know what it means to “eat healthy?” Surveys show that most people consider themselves to be good eaters. If that is accurate, then why do we have such a serious epidemic of obesity? Do you know what it means to “eat healthy?” Surveys show that most people consider themselves to be good eaters. If that is accurate, then why do we have such a serious epidemic of obesity? The answer, of course, is that many people don’t understand what it means. People often confuse the phrases “eat healthy” and “eat proper portions.” It’s universally accepted that not eating too much at one time is one of the best things we can do for our health. What you eat, however, is just as important, and perhaps more important, than how much you eat. Eating healthy foods in the proper portion sizes can make huge improvements in your overall health. When you eat well on a regular basis, you will notice that you feel better, you have more energy and stamina, and you have more room in that favorite pair of jeans! And if that’s not enough to convince you to make some changes, you will also lower your risk of heart disease, certain cancers, type-2 diabetes, high blood pressure, and high cholesterol. So, what does it mean to “eat healthy”? Are you ready to make the commitment but just don’t know where to begin? First of all, become familiar with the USDA or the Harvard School of Public Health food pyramids. Both are great resources to help you make wise choices. 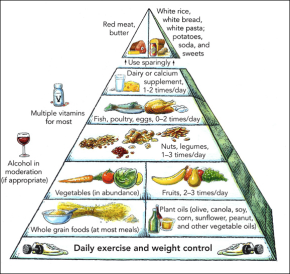 This food pyramid is from the Harvard School of Public Health and varies slightly from the revised USDA food pyramid. This will be a valuable tool in your quest for wellness. You’ll notice that the recommended number of servings varies quite a bit, especially within the category of whole grains. The number of servings you have should depend on your activity level and the total calories you eat each day. So, for example, if you exercise a minimum of 30 minutes a day, and eat 1,600 calories a day, you choose the lower number of servings. If you’re very active and/or eat 2,800 calories a day, you choose the higher number of servings. I found this wonderful, comprehensive site to help you choose healthy food and I immediately bookmarked it! Check it out today! What Constitutes A Serving Size? This is where those product labels come in very handy. You’ll want to be able to accurately understand the information to help you eat healthy. 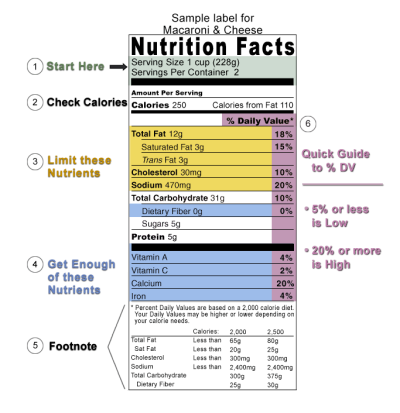 Learn everything you need to know to analyze a nutrition fact label. It’s one of the most valuable tools we have in the quest for wellness! The following chart illustrates information you will need for your commitment to “eat healthy.” This information applies to all adults over the age of 24, with the exception of nursing mothers. While exploring ways to eat healthy, I discovered a beautiful website about natural juicing remedies. A tasty and efficient way to prevent and ease many health problems is through all natural juices. Check out this informative website and try some of their amazing recipes! I am very pumped up about this product! Easy Diet Labels are the most exciting weight loss tool I’ve seen in years! These easy to use labels will help you and your children make healthy food choices in your own home. Just affix the appropriate labels to the food products that you buy and watch your family make healthier choices. 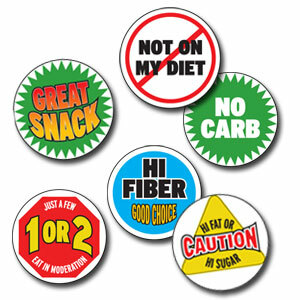 These labels come with messages such as “great snack”, “caution”, “heart-healthy”, “low-cal”, “high cholesterol” etc. Check out these fantastic labels…It’s never been easier to eat healthy! Do you wonder how many calories you’re consuming? Check out our new ”Calories in Food” information! 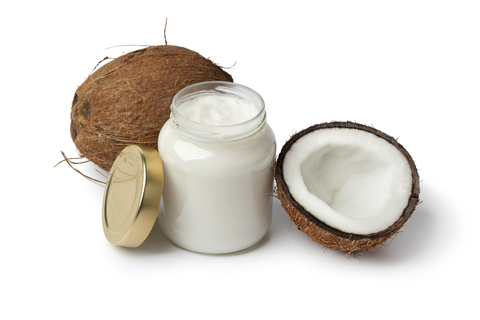 Aside from weight loss, coconut oil can increase your energy levels; sate your cravings for carbohydrates and sweets, and help you feel fuller after a meal. 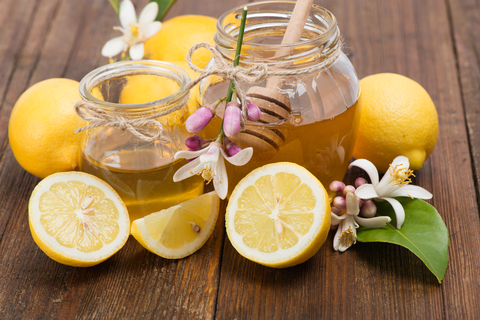 If you struggle against weight gain, consider using raw honey and lemon for natural weight loss. 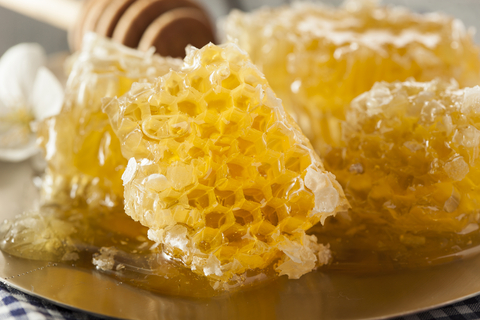 Raw honey benefits weight loss and is a natural, more nutritious alternative to refined sugars. 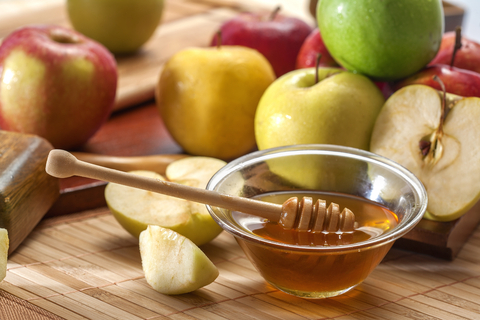 Apple cider vinegar and raw honey weight loss remedy combines the strength of two natural health foods. Information on this site is not intended to take the place of medical advice. © 2018 Easy Weight Loss Tips. Powered by Jekyll & Minimal Mistakes.